1429 Uncharted Seas slot may have an odd title but to the enlightened it's simply a reference to the voyages of Leif Ericsson who was reputed to have discovered North America in that year - way before Columbus. As Thunderkick are a Swedish developer it's not unnatural that they would celebrate his adventures and there is growing historical evidence that supports this belief. So unsurprisingly we have a nautical theme and the reels are set over an ancient parchment map with dramatic music and thunder to accompany our play. So will our balance get us to the New World or be swallowed in the cold waters of the Atlantic? 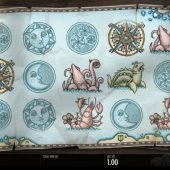 There are 25 pay lines for us here over the usual 5x3 grid and the icons are old drawings of the various creatures you could encounter at sea plus items useful to the voyage. The theme is quite rare, Merkur's Voyage of Discovery is the most similar and Novomatic have Captain Venture which is a shame as I'd like to see historical subjects in more games as opposed to sweets and cartoons, but hey! what do I know? The Mermaid will pay you a decent 50x bet for 5-of-a-kind followed by the Turtle or Giant Squid at 10x, Lobster or Whale at 6x and the Sun, Moon or Stars icons at 3x for the full line. 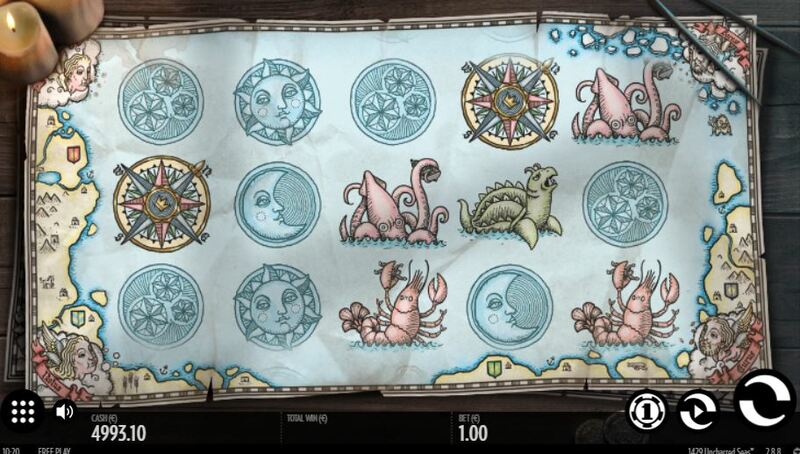 You see some nice Ship expanding Wilds on the centre 3 reels which when counting in a win have the feared Sea Serpent rise up and consume the ship in a fun animation and finally there are Compass scatters on all reels of which 3 or more are required for the free games bonus. Should you land 3, 4 or 5 compass scatters then 10, 20 or 50 free spins are yours respectively. You cannot retrigger them but the expanding Wilds seem to appear more frequently during them. If you saw all 3 Wilds with a Mermaid on the same row either end you could win up to 500x bet but otherwise the yield tends to be modest.